After a brief intro to the events that transpired when Ed was 11 and Al was 10, the episode begins with the boys forging through the desert to investigate the practices taking place in the city of Lior. Once they arrive in the city, Ed is able to quench his thirst at a friendly vendor's stand. That is when they hear a religious broadcast by Father Cornello. The city residents think very highly of the father and believe he is able to perform miracles. When Al accidentally breaks the vendor's radio, he performs alchemy to fix it. This truly impresses the man and others. A cloaked woman (whom we later learn is Lust) turns to Ed saying that he is well known in East City as the "Fullmetal Alchemist." Of course, everyone believes it is Al at first, resulting in Ed's furry over "short" comments. That's when Rose walks up with offerings for the church. The vendor asks if Rose could take the boys with her to the "Church of Leto." Once at the church, Father Cornello agrees to let the boys stay for the evening. While there, they learn that Rose lost her boyfriend to a terrible accident and that she has no other family. She is hoping that her dead boyfriend can be brought back to life by Father Cornello. Later in Lior's square, the High Priest (Father Cornello) is performing miracles to the amazement of the residents. However, Ed and Al notice that it is definitely alchemy, but somehow the Father is not abiding by the laws of equivalent trade. How can this be? Rose hears the boys and refuses to believe the priest is a fraud! Afterwards, inside the Father's office, the High Priest and his accountant (Clay) discuss their two new visitors. After hearing that Ed is a Dog of the military, both feel it is God's will to kill the boys. When Clay fails, a frightened Rose runs in fear. The boys find her in the lower level of the church. Now it's High Priest Cornello's turn. He is wearing a ring that Ed refers to as the philosopher's stone. It was the only way he was able to bypass the principle of equivalent trade without drawing a transmutation circle. The priest responds calling the ring his amplication device. He continued saying how he revived this city when a civil war was going on and threatened it with destruction. He made water into wine, created buildings and even gave people money. All leading them to believe that it was spiritual miracles. Ed doesn't care about all that and wants him to hand over the stone. The priest refuses! 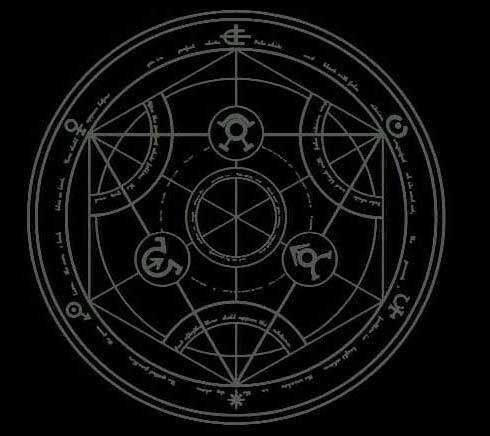 Using alchemy, Father Cornello changes the floor to sand (so no transmutation circle can be made) and releases chimera animals to attack the boys. Ed easily defeats the chimera's. From within the shadows Lust and Gluttony watch. "He is the child," she says. The Father, however, is shocked that his chimeras could not harm the boy. That's when Ed shows his body. Rose looks on stunned as the priest gloats, "You tried to perform the greatest taboo and now the rest of your body has crossed to the other side! That's why his title is Fullmetal Alchemist!" What is the fate of the boys??? Find out in the next exciting episode. This episode continues as Ed and Al encounter the corrupt Reverend Cornello. Rose watches in horror as she learns what exactly happened to the two boys. The Reverend uses alchemy to produce an oversized machine gun. Luckily, Ed and Al use alchemy to create an exit to escape. Seeing all this and hearing it is taboo to do human transformation, Rose begins to wonder if it is possible to bring back her beloved Cain. The Reverend says not to worry, because with the power of the philosopher stone equal exchange is not necessary. She is delighted when he takes her to a room where behind some curtains she hears the voice of her dead love calling her name. The Reverend, however, says he still has work to do before bringing him back for good. Later that night, the priest announces through the loudspeakers that all citizens of Lior are to find and capture what he called the two heathens. The citizens eventually surround the boys. Using the philosopher stone on his ring, the priest brings to life the Ledo statues that grace the city, and the two boys are taken down one by one. While Ed sits shackled in a dungeon, the Reverend wakes up from a nightmare only to find Lust in his room. She says no one was supposed to know of the red stone. The next morning, the Reverend sets out to destroy anyone who knew he was using the philosopher's stone. At the same time, Rose sneaks into the room where she believed her Cain was. The Reverend enters shortly afterwards revealing that Cain was nothing more than a bird-type chimera that could use Cain's voice. He locks her in the deadly room and instructs the chimera to attack. Lucky for her, Al came in time to save her. He takes her out of danger to a roof where he is working on the city's speakers. Meanwhile, the Reverend has set his sights on killing Ed next. When the two are face to face, Ed is able to get the man to pour out his true intentions. Imagine the Reverend's surprise when Ed reveals a microphone was set up behind him and all of the citizens heard his confession. The Reverend runs outside to find the citizens gathered to question him. He tells them the heathen used his voice and shows them another miracle with the statues. Ed exits the building telling the Reverend to stop. The priest doesn't believe Ed could do anything without the pocket watch he had taken earlier. Ed proves him wrong and brings to life a massively huge statue. When the Reverend wants to use his philosopher stone to retaliate, it rebounds effecting his arm. Suddenly, it shatters proving the stone was just a fake. In a building nearby, the Reverend learns the true intentions of Lust, and in the end, Gluttony was able to sooth his growling stomach with the abundant meat of the Reverend. A new reverend appears saying an imposter had taken his place. The citizens are delighted and given hope once more. Lust watches this from a window. "Envy, you must stay in that body for a while," she says.